This family owned B&B/self catering Lodge & Campsite is set in open park land with hard standings, 30 electric hook-ups, shower block, laundry room, campers kitchen and R.V. service point. It provides a substantial income for 6 months operation but is licenced all year round. 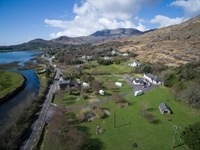 The lodge and campsite is located in the idyllic village of Adrigole, 500 metres from the sea shore overlooking Bantry Bay. 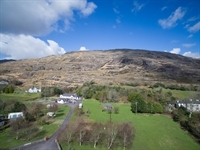 The site is ideally placed on the famous Wild Atlantic Way, the longest signed driving route in Europe and so the business has benefited greatly from this. Adrigole is a parish centrally located between Glengarriff and Castletownbere. Glengarriff with its top-line attractions, Garnish Island that has collections of rare plants from around the world, The Bamboo Park has a unique collection of Bamboos and Palms and Glengarriff Nature Reserve is a conserved ancient oak forest. Castletownbere sits between the Caha and Slieve Miskish mountains overlooking Berehaven Harbour. It is Ireland’s largest white fishing port and therefore has many excellent sea food restaurants. The town hosts a regular country market, Dunboy Castle, Buddhist Meditation Centre and home to a multitude of artists, writers, and artisan food and craft workers. Adrigole is flanked by the Sugarloaf Mountain to the east and Hungry Hill to the west. The mare’s Tail waterfall flows down the southern face of Hungry Hill and is reckoned to be the highest waterfall in Ireland. From Adrigole the Healy Pass winds northwards across the Caha Mountains providing spectacular panoramic views of the northern and southern shores of the Beara Peninsula. It is rich in historical and archaeological sites that include a wedge tomb that dates from 250BC as well as standing stones and a stone circle. The rugged coastline includes sandy inlets suitable for bathing, fishing and water sports. The Wild Atlantic Wildlife Centre is based here where you can kayak with the seals or be a passenger on a skippered half day or full day sailing adventure. The owners detached 3 bedroom, 3 bathroom, bungalow is available by separate negotiation. The Lodge and Campsite enjoys a breathtaking and unique setting overlooked by mountains on three sides and is adjacent to Adrigole River and the seashore. 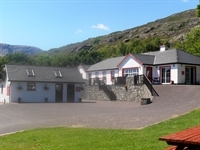 This easy accessible lodge and campsite attracts visitors from all over the world due to its tremendous location on the Beara walking and cycling routes and the business is ideally positioned to capitalise on a broad range of clientele who enjoy the ruggedness, tranquillity and beauty of the Beara Peninsula. This easy to operate business derives its income through the 6/7 room Lodge, B&B or self catering rooms. There is a high volume through the letting of tent, motor home and caravan pitches in addition the vendors also have a Log Cabin, 2 Euro tents and a Stone Cottage for self catering. All season caravan pitches are also available on site. There is excellent opportunities for further development i.e. Log Cabins in raised wooded area and Glamping expansion, at present we have two units for hire.